The Healthy Hunger-Free Kids Act of 2010 brought about changes that will result in healthier children. New resources are continually being developed to help districts enact these important changes and best practices are highlighted on a variety of Web sites. Everyone can use ideas to enhance their programs so see the sites below to get direction on how to promote your program and be inspired with all the possibilities. On September 17, 2014, the United States Department of Agriculture, Food and Nutrition Service announced the availability of the HealthierUS School Challenge: Smarter Lunchrooms Application. The application is updated to reflect the criteria implemented on August 31, 2014. It also provides helpful tips to make the application process simpler as schools strive to be recognized for excellence in smarter lunchrooms, nutrition, and physical activity. 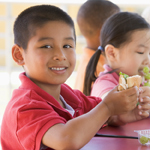 For more information about the HealthierUS School Challenge: Smarter Lunchrooms and additional resources, please visit http://www.fns.usda.gov/hussc/healthierus-school-challenge-smarter-lunchrooms. Questions about the 2014 criteria or application can be sent to TeamNutrition@fns.usda.gov. The Center for Ecoliteracy is a strong supporter of healthier school meals. They have conducted hands-on trainings for food service staff using their "Cooking with California Kids" cookbook. Their Web site contains tools for demonstrating to decision makers that high-quality, appealing school meals contribute importantly to academic achievement and student health - and can also be good for district finances. See more at http://www.ecoliteracy.org/downloads/making-case. Back-to-School Resources: Torrance Unified School District developed 3 educational flyers on the new meal requirements for Back-to-School Night and has made them available for general use. The flyers were created in Microsoft® Publisher and you can adapt the text and pictures to include your school district information. Are you looking for fun ways to promote nutrition and physical activity at your elementary or middle school? If so, download the Team Nutrition Popular Events Idea Booklet.